The statistics shows the average number of civilian deaths per day by car bombs and suicide attacks in Iraq war from 2003 to 2013*. 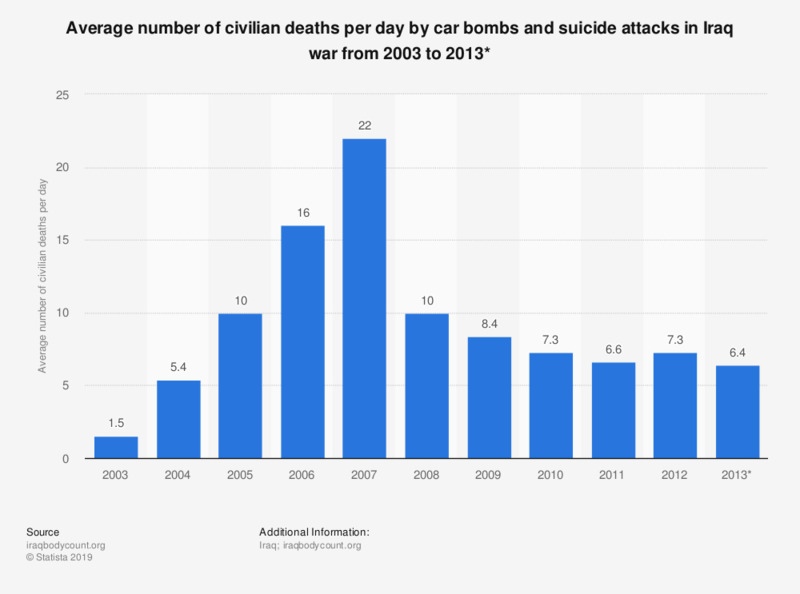 As of January 19, 2013, there were an average of 6.4 civilian deaths per day caused by suicide attacks and car bombs in 2013. The Iraq war was launched in March 2003 upon the invasion of Iraq by U.S. forces. Eight years later, in December 2011, the US formally declared and end to the Iraq war. According to the survey among U.S. citizens, which was conducted by Gallup in March 2013, ten years after the invasion of Iraq, 53 percent of the participants stated that the Iraq War was a mistake. Civilian casualties are the deaths of non-military individuals as a result of military operations. Due to the data from Iraqbodycount.org, 29 thousand civilian deaths were documented in 2006. Many of these fatalities were caused by car bombs and suicide attacks. The average number of civilian deaths per day due to these methods culminated in 2007 with 22 people killed per day. Not only civilian casualties can be counted during the Iraq War, many American soldiers lost their lives in the Iraq War. In 2007, 904 U.S. soldier’s deaths were reported in Iraq. * The figures for 2013 are up to January 19, 2013.